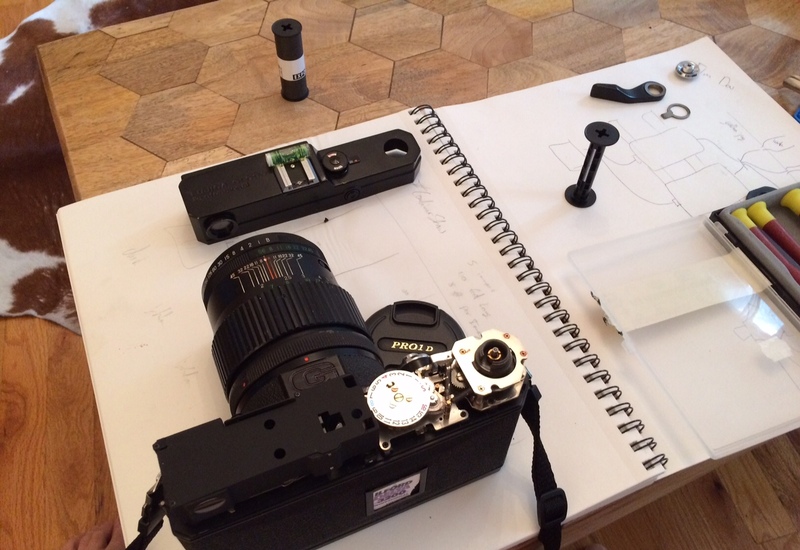 How to Adjust Your Fuji Rangefinder in Under 5 Minutes. Some members on Rangefinderforum.com have been speculating on why the Fuji 690 series is not so popular here in the states. Never strongly marketed to the US consumer. Fuji never gained the notoriety of Leica or Hasselblad (the former having lots of famous photographer adopters and the latter going to the moon). It’s an admittedly big and bulky camera. More reasons on the forum here. 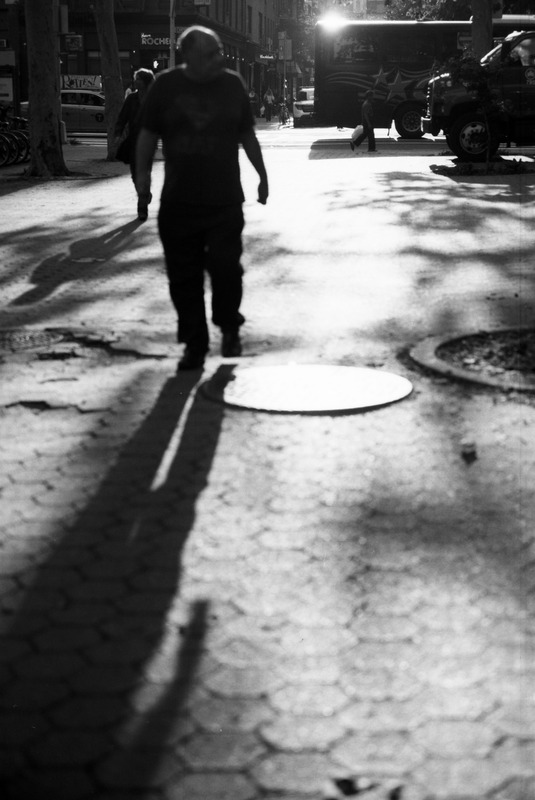 One consequence of having such an unpopular camera is that there are few resources to help you service and use it. I could pay Nippon Photo Clinic to do it, but rangefinders were designed to make it easy to change the alignment. So let’s forgo the $30 expense, take five minutes and just do it. Note – this should work the *exact* same way for a Fuji G690 or BL690 and probably the same way for a GW690. I’m not really sure it’s called the ‘shutter collar’ but it sounds reasonable so lets go with it. It’s basically a collar that surrounds the shutter release on the top of the camera. You have to unscrew it and then remove the thumb winder and its assorted bits. 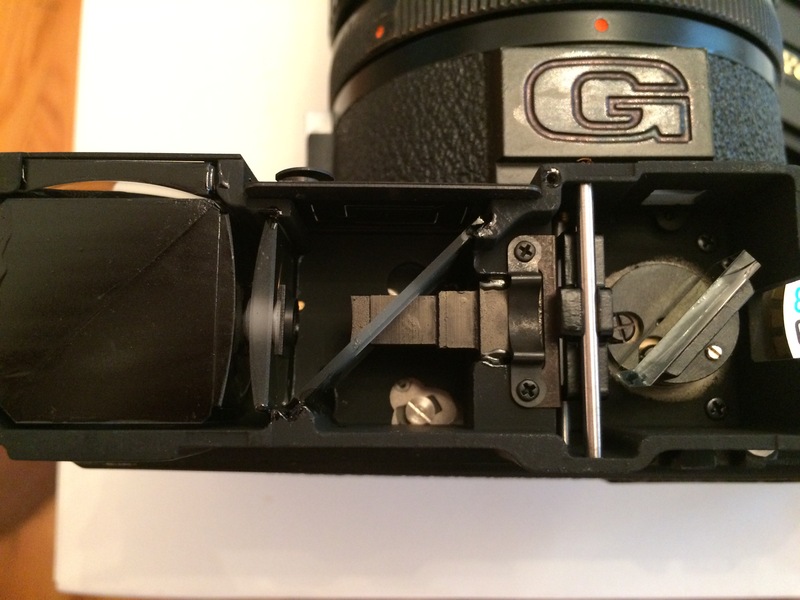 Since the shutter collar is smooth, it can be difficult to remove. I use a visegrip along with a couple of pads of rubber. Using a wrench without rubber would work, but it would chew up the chrome. There are four screws holding the top plate to the camera. Just easily remove them and set them aside. Now remove the top plate. It take a little bit of pressure for it to come off, but just work one side at a time until it does. Now you’re ready for some horizontal adjustment. Go to the front of the camera. There are two screws next to the RF patch mirror window (mine are rusted). Notice the tiny copper colored flathead screw in between them. This is your adjustment screw. I set my lens at infinite and started playing with different directions of turning and seeing how that impacted the RF patch. If memory servers, turning this clockwise moved my RF patch to the right. The adjustment is very fine-grained so I had to give it about one full turn. After I got it nailed down at infinite, I gave myself a sanity check. I measured 7 feet of distance between myself and a chair, set my lens at 7 feet (the closest my 150mm lens will go) and looked at the rangefinder. It was spot on :-). See those lines on the right in the photo? Yep, those illuminate the framelines in the viewfinder. 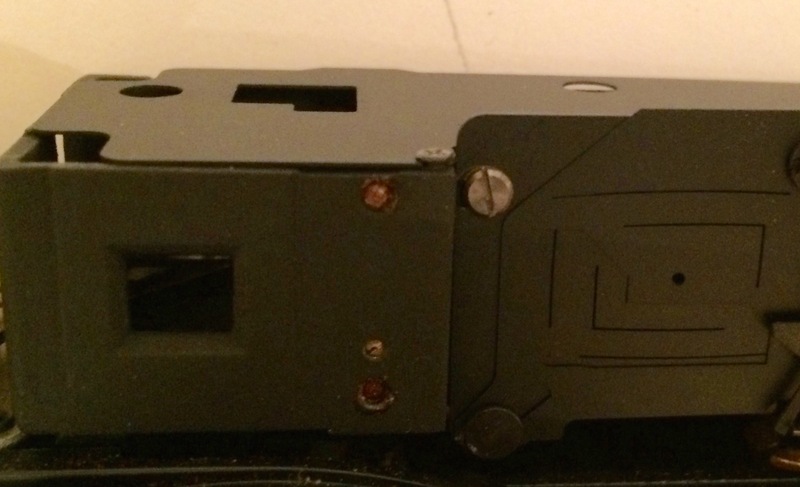 Now you’ll have to remove the top plate of the rangefinder assembly. Not difficult. There are two screws on the top which need to be removed. There’s a third screw in the upper left hand corner but no need to touch this one. The mirror sitting on a circular piece of metal is what we’re after (notice it on the right hand side of the photo). There’s a small silver flathead screw behind the mirror. This is not* as finely grained as the horizontal alignment and a quarter turn threw off the alignment pretty significantly. Now with your alignment all setup, why not clean all of the windows that let in the light to your RF? Front internal main viewfinder window – I only cleaned the outside. In order to clean the inside, I would have to disassemble more items and there was no need. Rear internal main viewfinder window – The same as above, I only cleaned the outside and didn’t want to disassemble more bits. Now you could have some significant haze within your viewfinder. Depending on what glass that haze lives on, will dictate how much work you have to do. Likely it’s on one (or more) of the four aforementioned windows. In which case, cleaning is a breeze. You’re camera should be sharp and as good as new. What an extremely community-minded and helpful post! Thank you stillthrill. Why thank you Emily! I miss your communal amelioration. Let us help the commune together! I followed these instructions after realising the vert alignment on my GSW690 II was out. The inside of the MK2 is similar but different enough to be a bit confusing after looking at your images. 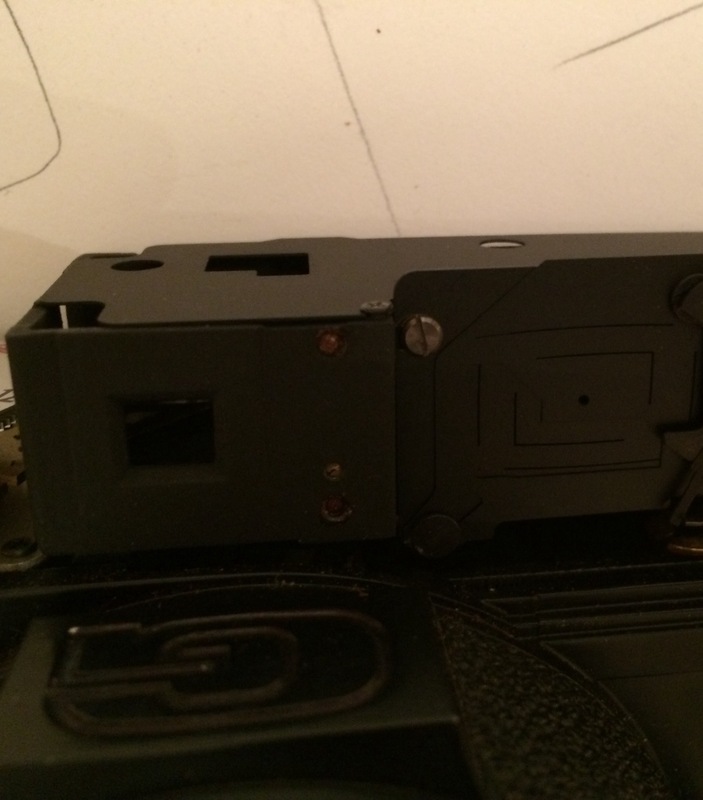 But once the layout inside the MK2 is understood its actually far easier because the rangefinder assembly top plate doesn’t need to be removed to access the adjustment screws because there is an access hole cut in place ready. The only problem with the MK2 that you need to be careful about is the hotshoe connection wires which limit the ability to completely remove the cameras top plate, you just have to be gentle, and swing it out of the way. Yeah, definitely no more than 5 minutes work though. Really appreciate the post. Lee. Thank you for the comment and glad you found it easy. I absolutely love these cameras. The only thing I think I would ask for from them is a longer lens (like a 110 or 120 for a true 50mm equivalent) and the ability to focus closer. I have the GL690 along with the 100mm and 150mm lenses. But without the EBC coatings, the color photography just isn’t there. They are great for BnW. But nothing renders a scene like the 90mm EBC coated GW690 in color. It’s simply… stunning. I don’t know any other camera that can come close. Thank you! I am working in China and just bought a GL690 and AE100 from Japan. 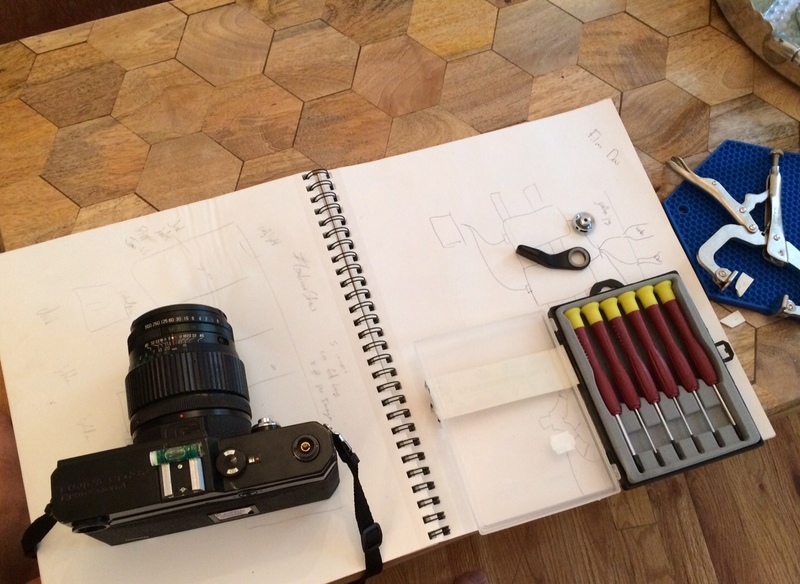 The rangefinder is out and I cannot send it O/S due to the cost of postage…and who do I know here that can do this???. Quick search and up came this which is 100% the information I need. Wonderful. Thank you again. No idea who can help you in China. What do you mean by “the rangefinder is out”?